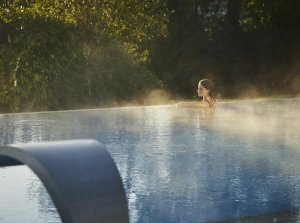 The concept behind Fota Island Spa, Cork is one of wellbeing, offering a unique combination that caters for both the restoration of personal energy and vitality or holistic relaxation and pampering. 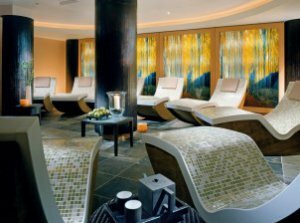 Fota Island Spa, at the Fota Island Hotel & Spa, lies deep within one of the most dramatic and outstanding natural settings on the Irish Coast. 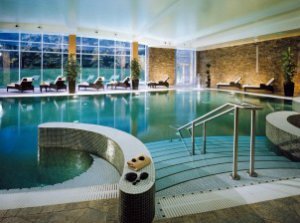 The Spa features a full fitness suite with Life Fitness equipment, an indoor heated swimming pool (children permitted 9-12pm and 4-6pm) and a superb hydrotherapy suite, home to Ireland’s only walking river, which is renowned for its assistance in healing sports and fatigue related injuries. 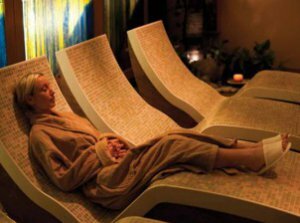 With eighteen spacious treatment rooms offering over sixty treatments, Fota Island Spa is rightly regarded as one of Ireland's finest and best equipped spas. An exhilarating thermal salt exfoliation followed by a loofah scrub. Completed with an application of crème or lavender body spray. A gentle chamomile oil body scrub recommended for normal to delicate skin types. Soothing & relaxing. A sunshine body scrub to exfoliate and aid cell renewal, leaving the skin looking fresh and revitalised. Laminaria digitata seaweed to stimulate and balance your metabolism. Fucus seaweed to refine your silhouette. To rejuvenate and improve skin tone. To relax and promote well being. To eliminate toxins and re-energise. To nourish and hydrate the skin. A full body three-in-one treatment. a body envelopment & a luxurious oil application. A rich exfoliating diamond, glycerine oil and marine salt body polish is applied to the body, helping to gently remove dead skin cells. A moisturising milk and honey wrap nourishes and hydrates the skin. This amazing ritual is completed with an application of luxurious gold cream. The tremendous energy of 24 carat gold will leave the skin magnificently supple, silky and luminous, gleaming discreetly with golden essences. This is a ritual of pure sensory delight and deeply relaxing for the whole body and mind. It will invigorate and revitalise the skin thanks to the 100% Natural Vanilla, Coconut as well as the rare and powerful Sandalwood, Neroli and Jasmine essential oils. A revitalising coconut body polish followed by coconut body wrap and completed with precious body oil applied to the skin. All [Comfort Zone] body treatments begin with the Tranquility Welcome Ritual, to relax and soothe the senses in preparation for treatment, and incorporate a comfort touch body massage. Dreams of lavender fields envelop your senses as you drift on waves of blue in this completely balancing and rejuvenating spa experience. To begin, earthly minerals are combined with lavender's healing properties in an invigorating full body exfoliation. Following is a pampering back, neck and shoulder massage with organic lavender oil and warm healing stones. As an added treat warm lavender oil will be applied to the full body. Next nourish and relax inside a warm cocoon, while a luxurious foot and pressure point scalp massage completes this head to toe service. quality. We have only one body. We have only one planet. Flourish Organics take this into consideration and treats both with great love and care. an in-depth consultation with your expert therapist, which will enable your therapist to tailor the treatment specifically for your individual needs. mind. It brings balance and harmony to the energy centres of the body. Aromatherapy harnesses the energy and therapeutic benefits of the finest organic flowers, herbs and resins and blends them to create an oil that is pleasing to the senses and a harmonizer of energy. Each massage is infused with a gentle healing energy which adds an extra dimension to the treatment - deeply relaxing, the Chakra balancing energy flows through the entire Chakra system clearing any blockages, warming both body and emotion and brings harmony and healing to your body, mind and spirit . Kerstin Florian have combined a passion for innovative skincare, beauty, natural wellness & the spa lifestyle to create skincare programmes that deliver results with a beautiful sensory experience. A deep cleansing purifying treatment for all skin types. Exfoliates, renews, balances & nourishes. reconnect with nature, spirit, and self with this deluxe facial that combines modern skincare with the ancient art of aromatherapy. Ultra-oxygenating, anti-aging treatment based on vitamin-rich super berries and plant cell structures to fortify, rejuvenate, and renew. A deep cleansing and nourishing facial designed for the special skin care needs of men. Soothes the skin as it refines pores. Includes an uplifting massage and deep cleansing masque. results orientated treatment individually customised to address any skin type and concern, including sensitivity, fine lines, congestion and premature aging. Advanced formulas and luminising rice peel-off masque target hyper-pigmentation of face, neck and decolleté for immediate improvement to tone., texture and luminosity. What Mom really wants…time with you! This package can be done in one of our couples treatment rooms. Relax with a Tranquility Back massage, the use of warm essential oils and soft brushes, gently guide the way to achieving a quiet and peaceful mind and body, followed by a Taster Facial and Mini Pedicure. Relax and unwind with one of our massage treatments. Based on ancient Ayurvedic healing techniques involves massaging the head, face, neck, shoulders and upper back. Concentrating on the soles of the feet, combined with massage of the toes, ankles & calves. Thai Foot Massage detoxifies the immune system and improves quality of sleep. Regular treatments help to relieve everyday stress and reduce the risk of lifestyle ailments, which cause damage to the cardiovascular system. Please note: This treatment is suitable for pregnant clients who are past the first trimester of pregnancy. Using Bamboo whisks, smooth Bamboo sticks massage techniques, this massage will promote well-being, relieve stress, tension and stimulate blood circulation. This classical massage stimulates circulation, eases muscle tension, improves flexibility & relaxation. This is a massage of the full body combining both Hot Stone Massage Therapy and Swedish Massage. Reflexology is a complimentary therapy that promotes healing by stimulating the nerves in the body & encouraging the flow of blood. It has been known to help alleviate physical and emotional symptoms. The basalt lava hot stones massage combines therapist and hot stones working in synergy to give the ultimate massage experience. Your body goes through a lot during pregnancy so it is the perfect time for you to check out of reality and into a spa. BASQ NYC spa treatments are our special programme of skin salvation indulgent spa treatments. Remember take good care of yourself and find joy in the amazing achievement. Grab a few moments to care for yourself and enjoy. A customised full body massage using safe pre-natal techniques. 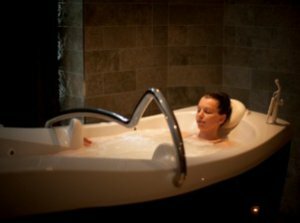 Designed to relax, reduce fatigue, release tension, aches, pains, swelling and other discomforts associated with pregnancy. This indulgent massage will help increase circulation and benefit Mammy-to-be. butter, which combine to replenish deep down while also soothing itchy skin. While we allow these absorb into the skin, the lower legs are massaged to assist circulation and reduce swelling and heaviness in the legs. reduce swelling and heaviness in the legs. of our BASQ Mega Moisture Butter to nourish the skin with a blend of our powerful omega oils. a BASQ maternity treatment are past their first trimester. Begin with a relaxing foot ritual, then enjoy a Tranquility back massage, the use of warm essential oils and soft brushes gently guide the way to achieving a quiet and peaceful mind and body, followed by a Customised Facial to balance and nourish the skin. Complete your journey by enjoying a glass of prosecco in the peaceful relaxation area. Relax and unwind with a welcome foot ritual, followed by a Kerstin Florian Customised Facial including Luxury Scalp Massage and Hand & Arm Massage. You will also receive €15 credit to use on retail, which can be used on the day of your treatment. Valid from April 1st to April 30th. 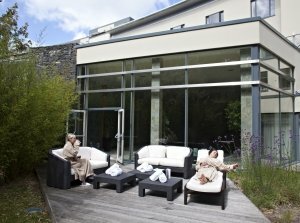 Unique to Fota Island Spa, the Serenity Massage allows you to unwind in total relaxation. Begin your treatment with a refreshing foot soak followed by a full body massage including a hot stones back massage. A foot mask and a face & scalp massage will then complete your relaxing, pampering experience. This is a massage of the full body combining both Hot Stone massage therapy and Swedish massage. The basalt lava stones are used in conjunction with classic massage movements to ensure a truly complete massage experience. 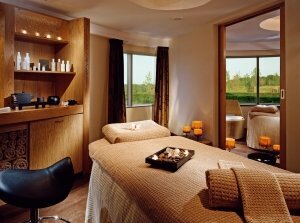 Take time to relax and unwind with our signature massage at Fota Island Spa. This treatment is designed to combat mental and physical fatigue with a rich chocolate full body massage which will leave your skin feeling soft and silky smooth. You will also receive a delicious chocolate mousse post treatment, the ultimate indulgence! body and mind rejuvenation. The journey begins with a full body exfoliation using a gentle Spanish rosemary and bamboo manna polish, followed by a full body massage using our unique blend of oils, combined with a luxurious silky lotion packed with healthy minerals and trace elements. the skin looking supple, vibrant and luminescent. These full day packages include lunch, chosen from our healthy options menu, and the time spent in our Thermal Suite and Hydrotherapy Suite. This wellness-inspired face and body experience promises to deliver full body and mind rejuvenation. The journey begins with a multi massage hydrotherapy bath, with added berry extract bursting with anti-aging properties. After unwinding in the bath your skin is treated to a full body exfoliation using a gently Spanish rosemary and bamboo manna polish. This top to toe treatment is followed by a full body massage using a unique blend of oils and lotions packed with healthy minerals and trace elements. After a luxurious scalp massage, the treatment is completed with a results-driven, anti-aging luminescent facial. We use our exclusive pearl Powder, an ancient beauty secret to exfoliate, nourish and bring effective radiance to the skin. An acupressure point exercise with firming extract refines the skin before using a cooling masque with luminous rice, as well as a concentrated powerhouse ampoule to provide long lasting hydration. Skin appears lighter, brighter, and more refined. Results are immediate, leaving the skin looking supple, vibrant, and luminescent. Tranquility bath and Pro Sleep Massage, relax in a luxurious bath nourishing tranquility oil to deeply hydrate and moisturise the skin. Complete your journey with an innovative massage which acts on three different sensorial pathways: smell, touch and hearing, for profound relaxation. The synergy of a unique blend of essential oils, the bespoke Tranquility Sound, Ayurvedic and Indonesian Sea Malay techniques combined with the use of soft brushes, gently guide the way to achieving a quiet and peaceful mind and body state. Relax and rejuvenate with our Kerstin Florian Customised Vitamin Facial. This anti-aging facial, which includes a customised exfoliating peel to renew skin, a relaxing massage to promote circulation, followed by a masque to balance and nourish the skin. Your journey is completed with a Full Body Massage, which will stimulate circulation, ease muscle tension, improve flexibility, and promote relaxation. Relax in a chocolate bath and combat mental fatigue through the active ingredients of the cocoa bean to experience total well-being. The Little Bit Sweeter Massage is designed to combat mental and physical fatigue with a rich chocolate full body massage, which leaves your skin feeling soft and silky smooth. You will also receive a delicious chocolate mousse post treatment. The ideal package for those looking to create their own unique spa experience . Your journey begins witha Turkish Body Scrub, a refreshing top to toe body thermal salt exfoliation that will invigorate tires, dull skin, boosting circulation with rich minerals and essential oils. A treat for the senses, this treatment includes a luxurious body créme to smooth and soften the skin. - Deep cleansing kerstin Florian Refresher Facial to demineralise tired, dull skin. The perfect antidote to modern fatigue and chronic stress in the skin and the muscles. The treatment starts with 15 mins Bamboo Back Massage to relieve stress and stimulate blood circulation, then followed by Skin Regimen Urban Longevity Facial – the combination of natural aromas, Macro Waves Sound and Qigong & Roullage massage techniques to recharge and correct the skin. Available Monday to Friday, also available on Saturday and Sunday €20 supplement. Valid from 1st November 2018 until 31st January 2019. Together you can experience a massage which allows you to relax and rebalance the mind and body in our couple's suite. A treatment for couples and friends, experience a [Comfort Zone] facial side by side. Your therapist will consult with you on the facial best suited to your skin's condition. Please Note: A supplement of €10pp for the Chrono Reverser Facial and €20pp for the Chrono Reverser Collagen applies. 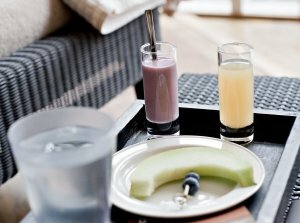 Includes lunch chosen from our healthy options menu and the use of our Thermal Suite and Hydrotherapy Suite. Each [Comfort Zone] facial treatment begins with a deep cleanse and exfoliation of the skin to brighten dull and tired skin. This is followed by a Face, Neck and Shoulder Massage. Your therapist will then consult with you to determine the [Comfort Zone] Mask and finishing product to best suit the condition of your skin. The perfect antidote to modern fatigue and urban lifestyle, this facial is ideal for when you feel your skin is stressed and showing the first signs of aging. Customisable to correct dullness, dehyration, and expression wrinkles. The combination of Skin Regimen natural aroma, Macro Waves Sound, and massage techniques such as unique Qigong and Rolling Roullage will leave you feeling recharged and ready to face your busy days. To moisturise, protect and hydrate dry and dehydrated skin. Renewing, fragrance-free, strengthening, and soothing treatment recommended for skins which are sensitive, fragile, and prone to redness. Smooths and restores the protective skin barrier through a delicate dermal-affinity action and strengthens the natural skin barrier through a delicate dermal-affinity action and strengthens the natural skin barrier. An ultra effective purification treatment for all skins, particularly for rebalancing oily and acne prone skin types. redensifying. Includes a collagen masque to plump the skin. 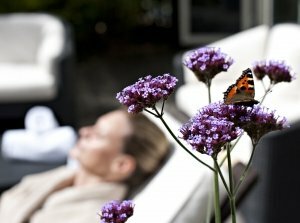 "I was here for the full day package which is €195,for that I got 3 treatments and lunch. The staff were lovely and I had the same therapist for the day which was nice I was able to build up a rapport with her, the changing rooms were not nice and are shared with people using the hotel pool, no privacy and no zen like feeling to the place. The lunch was also disappointing, I placed my order when I arrived only to be told after my first treatment that what I had ordered was no longer available, at 12.30am! So I had to make do with some cold wrap instead as they only offer an alternative from the Spa menu even though you have to get redressed to go across to the main hotel restaurant as there isn’t one in the Spa and because of this I would have thought they might have allowed me to choose from the restaurant menu. I've been to nicer Spa's and much better value for money so I won’t be returning." "I had the “Lighten your legs” treatment which is a maternity treatment. Very disappointing for 55euros and would have expected a lot more. All it involved was a soak of the legs first and then I’d say no more than 3 massages of each leg - only the lower leg. This is the 2nd time I have been disappointed by the spa. The last time I rang up to make an appointment and specifically asked could I have a face massage, but then when I went for the treatment I was told they could do a facial only. While the spa is very nice I think the treatments need to be upped as I don’t think they are good value for money." "I'm used to high end spas to be quiet and relaxing. When I was shown to the changing room I was shocked, it wasn't like any spa I've been to before, it was to be honest, a locker room like you'd find in a public swimming pool. The hotel pool and the spa share changing room, So what you get is lots of women and children coming in from the pool when you are supposed to get into your robe and slippers. I found that very off putting as well as the lack of privacy, I had to change in front of all them. Then I had an issue with the size of my robe. I'm not a small women and I had to go back to reception to ask for a bigger one, that was embarrassing enough. I had to ask a further two times and each time they gave me the same size. One receptionist even laughed at me when I asked for another robe. I felt awful and left in tears. It was horrible and mortifying, I would not recommend this spa! " 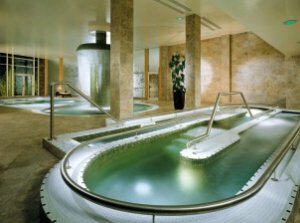 Buy Gift Vouchers for Fota Island Spa and other top spas across Ireland.